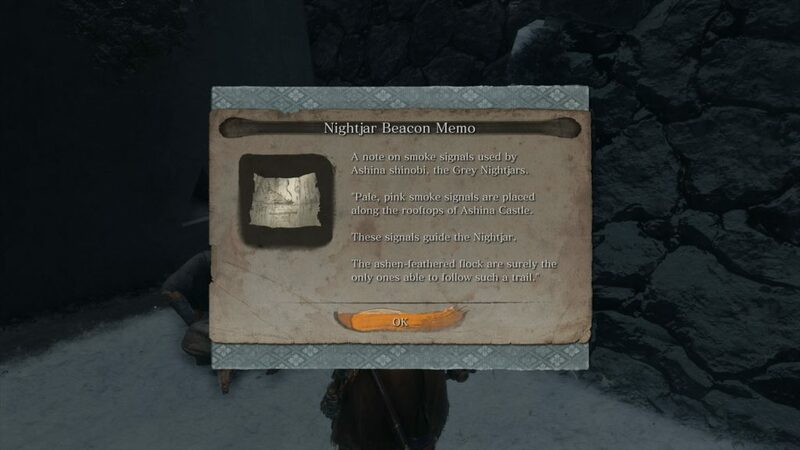 Nightjar Beacon Memo is an item in Sekiro: Shadows Die Twice. It’s a note you’ll get as a reward for helping a certain NPC, and it’s filled with cryptic writing. A lot of players are confused by it, wondering where you’re supposed to use it. This guide is going to show you how to use Nightjar Beacon Memo in Sekiro. Where to use Nightjar Beacon Memo? As the name suggests, this item is a memo. Like all other memos in the game, you’re not really supposed to use it. It’s there to give you additional information, to help you find a specific treasure or warn you of a situation. This means you should concern yourself with how to interpret the info rather than what to do with the piece of parchment itself. You’ll get it when you help Fujioka the Info Broker in Ashina Castle. After you clear the surrounding area of samurai, he’ll give you the note as thanks. If you take a look at the writing on it, you’ll find out that the Grey Nightjars, a group of elite shinobi, are guarding the castle and using pink smoke beacons to mark their way. This serves both as a warning – that you’ll encounter particularly nasty enemies on the rooftops – and as a pointer. The giant gate leading into the castle is closed, and can only be opened from the inside. In short, this memo tells you that if you follow the plumes of smoke along the arching roofs, you’ll end up on the inside. From there, it’s a brisk walk to the gate, and you’ve got yourself a shortcut. The biggest obstacle on the roof are the aforementioned Grey Nightjars. You won’t see them coming, but you will hear them if you know what to listen for. Many of them use kites to stay afloat, high above the rooftops. When they spot you, they’ll dive towards you, emitting a strange noise while they do. I just use abandoned dungeon entrance idol to fast travel inside the castle.